Over 80% of Americans own a slow cooker, and it’s easy to understand why because of how easy you can cook stews, pot roasts, and other slow cooker cookbook favorites. This convenient kitchen appliance makes it easier than ever to prepare gourmet meals with minimal effort and a smaller budget, particularly if you have one of the best slow cookers available. Many brands offer high-quality slow cookers, giving you lots of models to weed through. To help you shop for the best slow cooker for your unique needs, we reviewed the top models on the market. They all cook low and slow to bring out mouthwatering flavors. Here are the top 5 best slow cookers to consider. When it comes to kitchen appliances, sometimes investing in quality pieces that will last you a lifetime is the best way to go. If you want a programmable oval slow cooker, consider the All-Clad 7-Quart Gourmet Slow Cooker. It is a top-rated slow cooker that’s attractive enough to leave out on your kitchen counter. Digital controls: These controls make it easy to set it high, low, or medium so you can cook the way you need to. The cook cycles are easy to navigate. Extra functions: This slow cooker lets you cook in other ways, including browning, steaming, and rice cooking. Programmable timer: This slow cooker lets you cook for as long as you need to with a 20-hour programmable timer. Removable aluminum inner pot: You can use this pot for serving or pull it out to clean your appliance. Extra cleaning: You’ll need to wipe down the exterior more often than you would with other options. 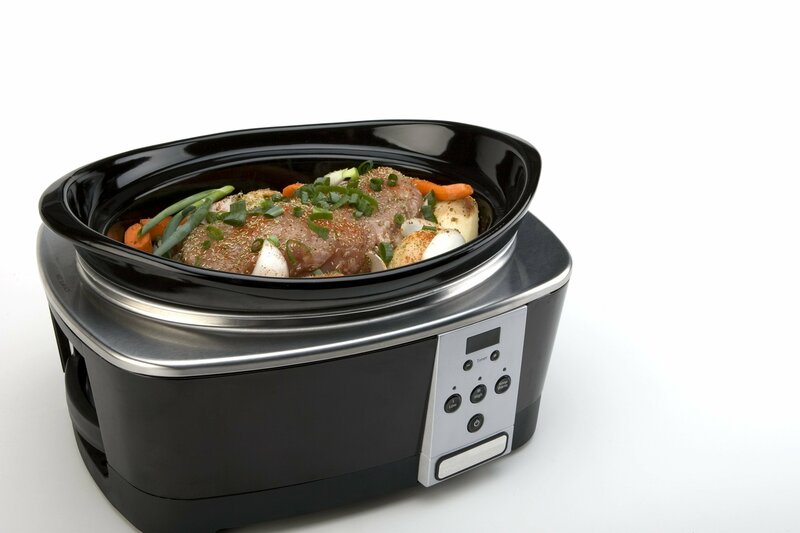 High cost: Because this slow cooker costs a few hundred dollars, many people may choose a different option. 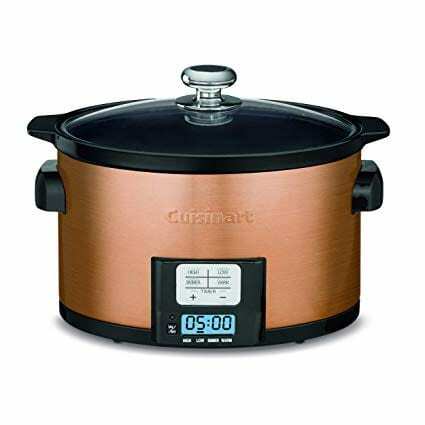 Larger size: This slow cooker is not great for small kitchen counters because of its size. Not wifi compatible: If you’re looking for all the latest technology and want to control your slow cooker from your phone, you’ll want to pick a different option. Hamilton Beach is well known for its quality kitchen appliances, and this slow cooker is no exception. 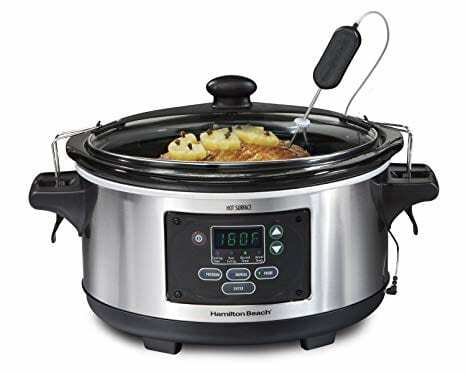 The Hamilton Beach Set & Forget 6-Quart Programmable Slow Cooker cooks roasts to perfection for an unbeatable price. It has three choices to make automatic cooking a breeze: program, probe, and manual mode. You can program the cook time, and the set and forget feature will automatically switch to warm when the cook time is up. This model will even keep cooking during brief power outages! 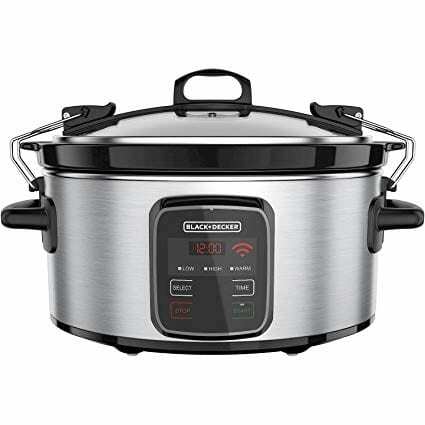 Affordable price: The Hamilton Beach slow cooker has excellent features at a reasonable price. Control settings: This slow cooker features clear, easy-to-use control settings. Probe cooking thermometer: The attached probe thermometer makes sure you always cook meats and other foods to the perfect temperature. Secure lid: The clip lock, gasket lid keeps your food securely inside the pot. 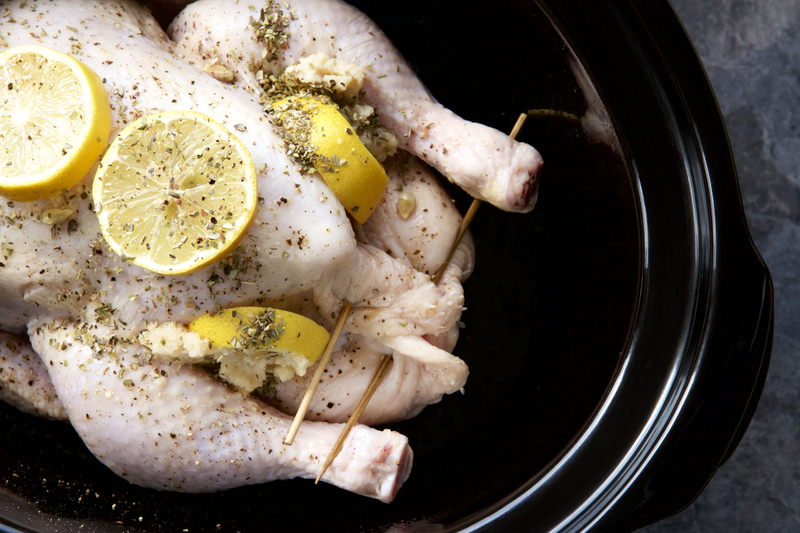 No self-cleaning functions: You’ll have to clean the slow cooker yourself. No WiFi compatibility: If you want your slow cooker to be a part of your smart home options, you will want to pick a different option. You can’t control this slow cooker from your phone. Not ideal for cook times over eight hours: This slow cooker is best for shorter cook times. If you live in a small space or have limited kitchen counter space, don’t panic. You can still reap the benefits of using a slow cooker. The Cuisinart 3.5-quart slow cooker is about half the size of your average slow cooker, but it doesn’t skimp on high tech functions. This small, sleek slow cooker comes in copper or stainless steel. It features four cooking settings and a 24 hour LCD timer. Dishwasher safe: The ceramic pot and glass lid are dishwasher safe for easy cleanup. Four cook settings: Pick the best settings for the food you’re cooking. The slow cooker will automatically switch to warm when cook time is up. Removable ceramic pot: The 3.5-quart cooking pot is removable for serving and cleaning. Touch control panel: This makes the slow cooker easy to control. No self-cleaning functions: You’ll have to clean the pot and lid yourself. Small pot: The size of this slow cooker makes it unsuitable for large families. This WiFi-enabled slow cooker makes it possible to cook from virtually anywhere. You can connect your slow cooker to your home WiFi so you can control the settings from your phone or other mobile devices. This model comes with an easy-to-use app. You can also use this slow cooker offline and choose from three heat settings and program the cook time. Affordable price: Considering the features included on this slow cooker, the price is reasonable. Manual controls: You don’t have to use the WiFi controls. You can also control the slow cooker directly from the appliance. Removable pot: The pot is easy to take out and dishwasher safe for easy cleanup. WiFi enabled programs and controls: You can use the free app to control the slow cooker from your mobile device. Lower quality materials: Some other slow cookers are made of higher quality materials than this one is. No self-cleaning functions: You’ll need to clean your appliance yourself. With this multifunctional appliance from Crock-Pot, you can transform the way you cook. It features digital meal settings where you can choose from cook options like meat/stew, beans/chili, rice/risotto, yogurt, poultry, dessert, soup, and multigrain. 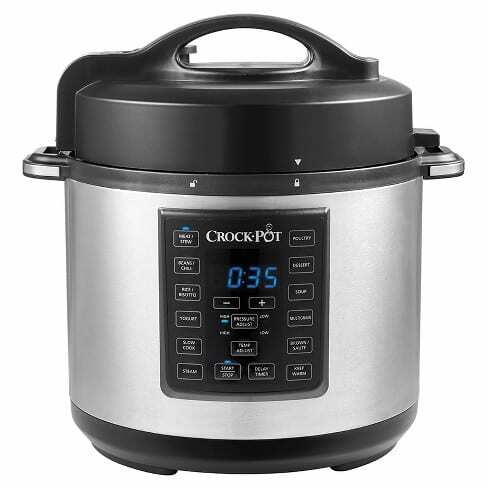 If you’re looking for a slow cooker rice cooker option or something that pressure cooks your meals, this is the appliance for you. This convenient, all-in-one machine lets you cook food fast or slow cook, depending on how much time you have. Cook settings: The machine gives you five ways to cook: slow, pressure, brown, saute, and steam. Digital controls: This option gives you one-touch digital controls to do everything you need to do. Dishwasher safe: The six-quart nonstick ceramic pot is safe in the dishwasher. Pressure cook options: This machine allows you to set the appliance at eight preset pressurized settings to cook food to perfection. No probe thermometer: You won’t be able to check cooking temperature with the appliance itself. No self-cleaning functions: The machine won’t clean itself, but the dishwasher safe aspect makes cleaning easier. No WiFi options: You’ll need to control the machine in person. 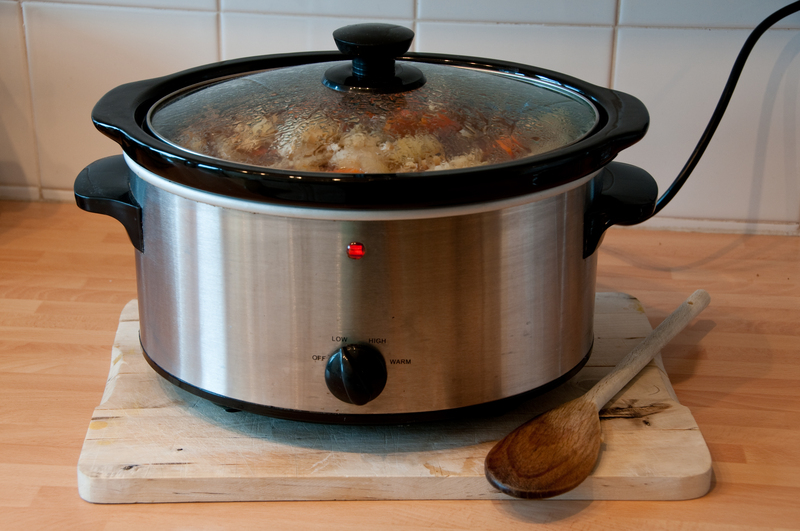 A slow cooker is likely to become one of the most used kitchen appliances in your home. Cooking at home can help you lose weight and save money, and this handy kitchen tool makes it easy to cook delicious meals with little effort. 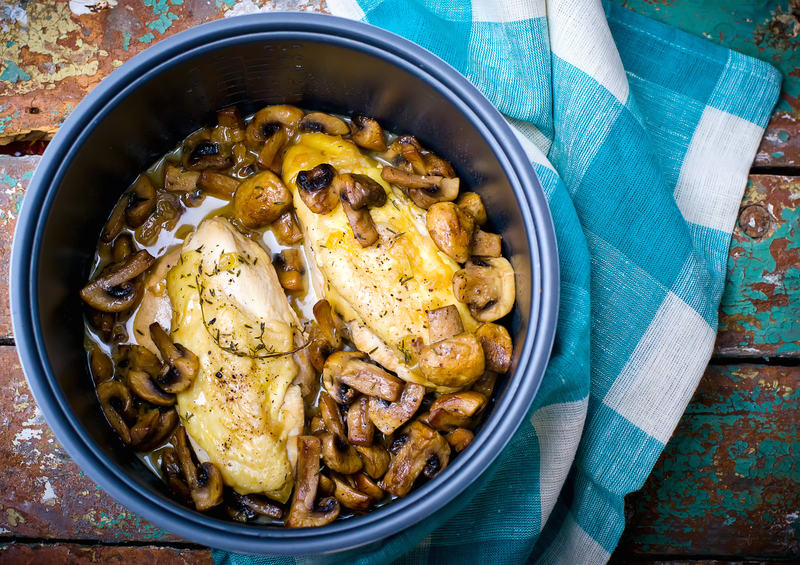 If coming home to a home cooked meal sounds ideal to you, it might be time to buy a slow cooker. Use our buying guide to help you find the best one for your needs. Choosing a slow cooker with the best size and capacity for your needs usually depends on how many people you need to feed. However, the size you need can also depend on how often you prefer to cook. Even if you only prepare meals for yourself, you might want a larger model if you like meal prepping or freezing meals. Slow cookers range in size from extra small to large. 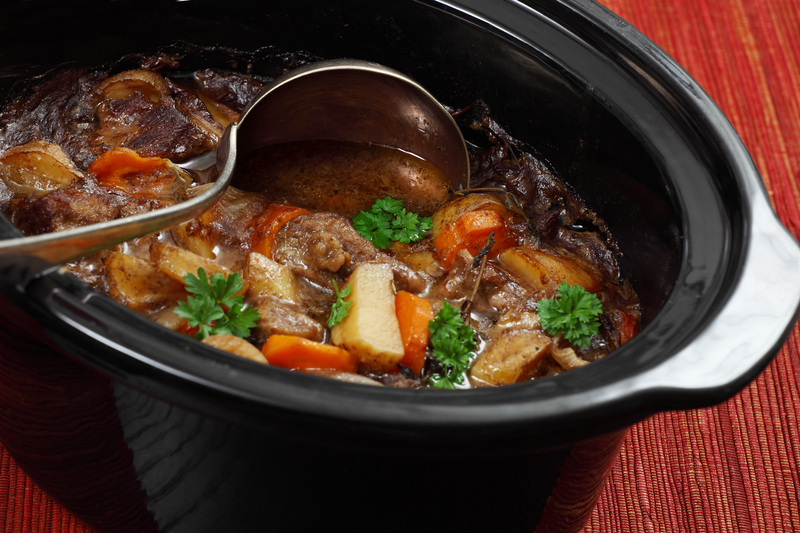 The average slow cooker is about 6-7 quarts, but you can buy them larger or smaller. Large slow cookers are generally best for larger families. A big slow cooker has at least eight quarts of capacity. This size is ideal for feeding between 5-7 people. If you want to feed even more people, consider a 15-quart slow cooker. Medium slow cookers are about 4-6 quarts and are capable of feeding 4-6 people. The 6-quart cooking option works for many families. Small slow cookers are about 1-3.5 quarts and are best for feeding 1-2 people. If you want to buy a small slow cooker, we recommend a 3.5-quart capacity. Some slow cookers also have interchangeable crock sizes. The 3in1 cook options give you the flexibility of having three sizes with one appliance. Note that slow cookers don’t cook as well when they’re full. When you’re considering what size slow cooker to buy, remember that they work best when filled to half capacity. All slow cookers come with a removable inner crock. Some are made of metals like aluminum and stainless steel, but the majority are ceramic or porcelain. Easy cleaning: You can take the pot out of the base to wipe down the interior and pop it in the dishwasher. Even food heating: Ceramic crocks distribute the heat better than some other materials. Healthier to use: A ceramic insert won’t leak any harmful toxins when heated to high temperatures. Safe to use in the oven, microwave, or on the stove: You can quickly reheat leftovers or cook other oven and stovetop recipes. These advantages make ceramic pots worthwhile. However, metal pots have other advantages such as letting your brown food. Slow cookers that come with a programmable timer can be a lifesaver. A programmable timer makes cooking more flexible because you won’t need to worry about burning a pot roast or setting the kitchen on fire. Programmable timers let you set the perfect cook time and automatically switch to a food warming function when the time’s up. You’ll find the programmable timer on the control settings on the front of most slow cookers. Some controls are manual, and others are digital. All are easy to use. Some slow cookers even have WiFi enabled functions. This allows you to set the cook time and control temperature settings from an app on your phone. If the slow cooker was on low medium heat and you need to move it to warm heat, you can do so from wherever you are. If you plan to use a slow cooker to bring cooked foods to potlucks, barbeques, or other gatherings, a good lid is essential. Slow cooker manufacturers introduced sealing and locking lids when customers started complaining about frequent spills. The tops weren’t staying in place while transporting meals, making it hard to cook and carry slow cooker meals. A sealing and locking lid makes sure you can take your slow cooker anywhere. Some tops even come with latches and gaskets to keep covers on tight for easy transport. However, as one of the most important cooking tips, don’t use fasteners while cooking. Gaskets seal the lids in place to prevent spills, but the latches can prevent steam from escaping and ruin your meal if you cook with them attached. All the steam trapped inside puts your slow cooker recipes and nice cuts of meat at risk of turning into a mushy mess. If you plan on transporting the food you make in your slow cooker, a sealing and locking lid is ideal. If you only plan on using your slow cooker at home, this isn’t a necessary feature for you. To keep your slow cooker running for years, take the time to clean it. While a slow cooker is convenient for cooking, cleaning one can often be a drag. 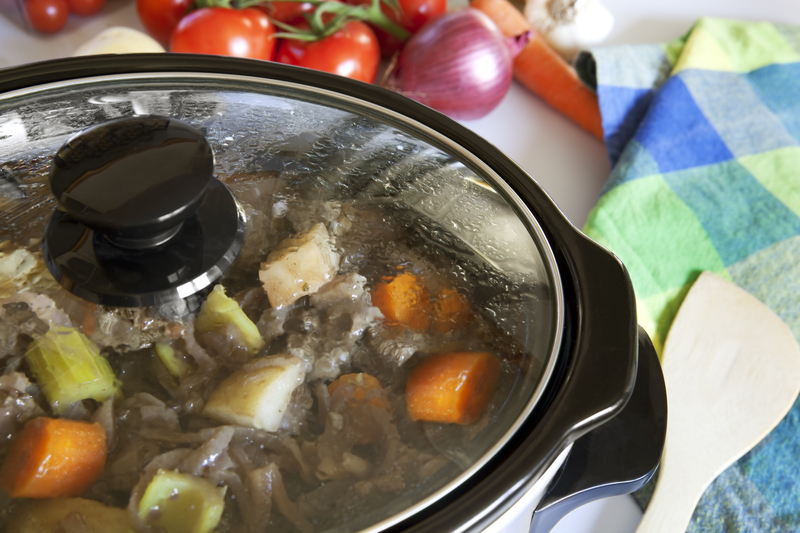 Long cook times can leave food stains and crusty bits on the interior and exterior of your slow cooker. Clean it regularly to keep your machine in good condition. Luckily, the inner ceramic crock pots are removable. The easiest way to clean them is to take them out, wipe them down, and put them in the dishwasher after every use. 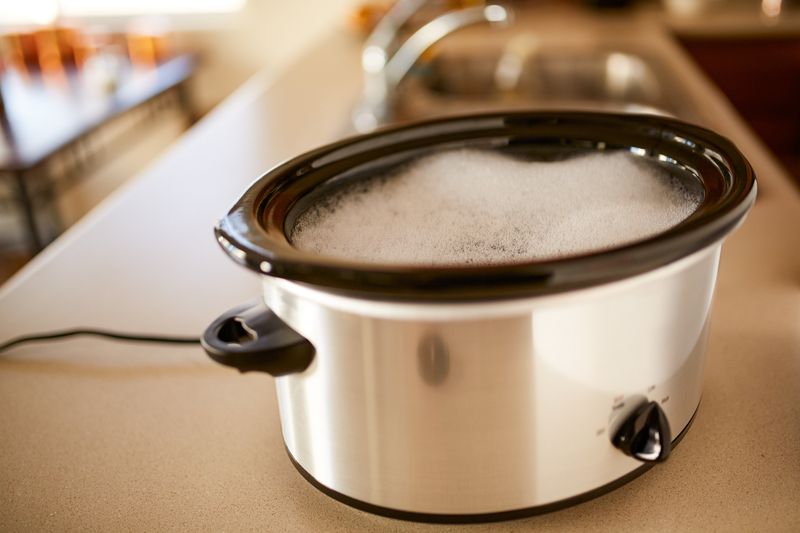 You want to clean your slow cooker as soon as possible. Waiting to wash the ceramic crock can make it harder to scrub leftover food off. However, always turn off your slow cooker, unplug it, and let it cool before you clean it. After removing the inner pot, wipe down the base to avoid food buildup and prevent stains. Fill your crock pot with water. Add 1/4 cup of baking soda and a splash of dish soap. Turn the crock pot on to high and let it soak for 2-4 hours. When buying a new slow cooker, consider the details of the manufacturer’s warranty. Here’s a quick breakdown of the warranty offered by the slow cooker brands we reviewed. 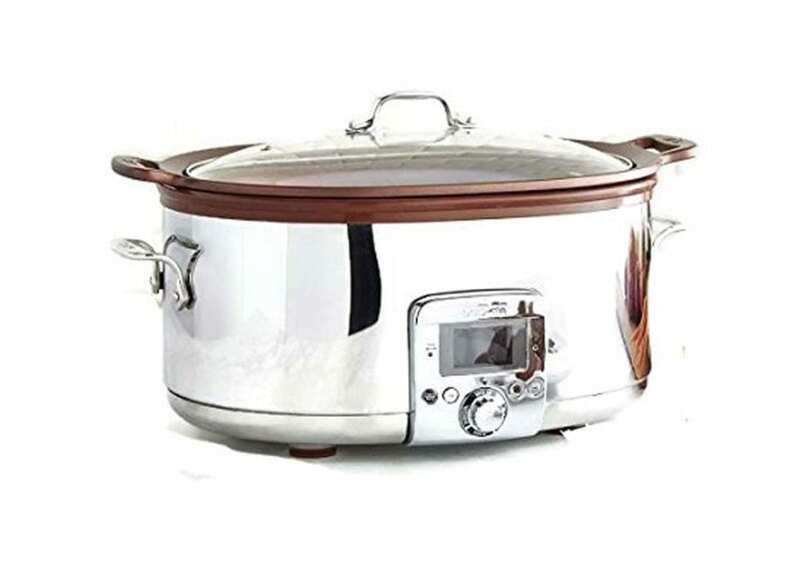 All-Clad is a leading appliance manufacturer and offers the best warranty on slow cookers. While the price of their kitchen appliances tends to be higher than other brands, a good quality guarantee can make up the difference in cost. All-Clad offers a lifetime warranty on slow cookers. The warranty starts from the date of purchase and covers the cost of replacement parts, materials, and construction under normal wear and tear. Damage caused by any abuse of the product isn’t covered. Stains and minor imperfections aren’t included either. Black + Decker offers a two-year warranty starting from the date of purchase. The warranty covers the costs of replacement parts, materials, and workmanship. It also guarantees replacement for defects. It doesn’t cover repairs due to abuse or accidental damage. It also does not include repairs if you first try to fix your slow cooker yourself or hire a third-party for repairs. Cuisinart offers a three-year warranty on slow cookers starting from the date of purchase. The warranty guarantees your appliance will be free of defects and covers the cost of workmanship and materials. It doesn’t cover any damage caused by accidents, misuse, or attempting to ship your appliance. This warranty also won’t cover damage caused by using your slow cooker with a convertible outlet. Hamilton Beach offers a one-year limited warranty on slow cookers. The warranty starts on the date of purchase and covers any workmanship or repairs due to defects. If the product or replacement part isn’t available, Hamilton will replace your slow cooker with one of equal or higher value. The warranty excludes repairs caused by special, incidental, and accidental damage. Crock-Pot offers a limited one-year warranty on slow cookers starting from the purchase date. The company guarantees the product to be free of defects and will cover the cost of materials and workmanship. If the replacement parts or original slow cooker isn’t available, Crock-Pot will replace it with one of equal or greater value. The warranty doesn’t cover normal wear and tear. 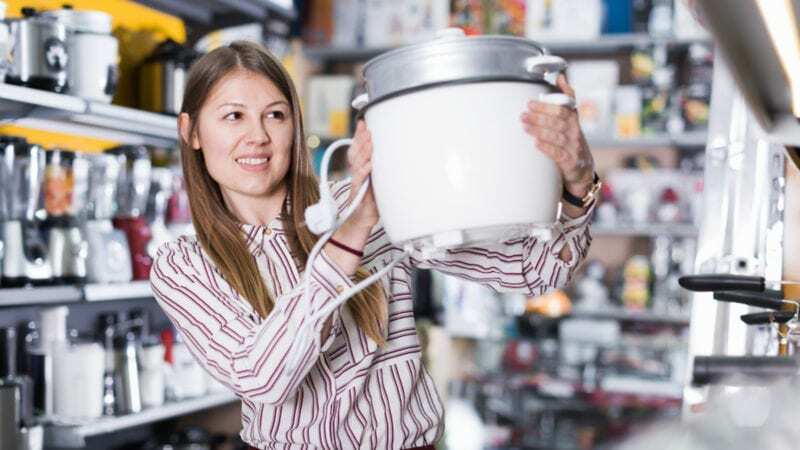 It also doesn’t cover damage due to negligent use or misuse of the product, improper voltage, or attempting to fix the slow cooker with the help of a third-party instead of Crock-Pot. When you buy a slow cooker, choose wisely. If you pick one of the best slow cookers available and take care of it, this kitchen appliance can last for years. Use our reviews and our buying guide to find a slow cooker you’ll love.